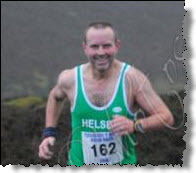 Hardy hill man Phil Gillard was our sole representative at Goyt’s Moss last Wednesday. Don’t fear though, if you’re kicking yourself for missing the chance to get wet, muddy and generally exhausted the good news is Goyt’s Moss is just the first in the Goyt Valley series. £5 pre-entry by June 1st or EOD by 1.50pm. Wednesday 22nd July 2009, 7.30pm. 5.9miles/1600’ from Errwood Sailing Club, Goyt Valley, Nr Buxton, Derbyshire. £4 on the night only. Sunday 11th October 2009, 11.00am. 13.5miles/2500’ from Burbage Institute, Bishops Lane, Buxton, Derbyshire. £5.00 on the day only. Something like the Whaley Waltz might be a good option for anyone new to the whole hill running thing (rumours of a river crossing are greatly exaggerated and shouldn’t put you off. Ahem).